This man – he is my heart and my life and my everything. He’s also a pain in my side at times, with his constant voice of reason and pragmatism. We’ve been together since I was 23, married for the past seven years, and the longer we’re together the more I find that we’re a classic story of opposites attract. And yep, it’s cheesy but I’m more attracted to him than ever (at least when he’s not ragging me for my music selections or for whining about this or that.) I always tell him he gets better as he gets older, and that is the Lord’s truth. Me and my heart (aka Hadley). This little love is 4 years old and I’m not even sure I can find the words to express how I love her, how I love being her mom, or how I simply feel privileged to know a child as genuinely sweet, empathetic, kind and thoughtful as her. 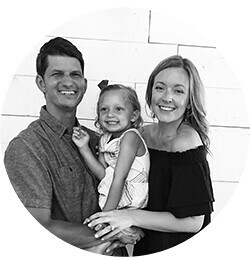 She is ALL girl – check out the necklace, skirt and headband, those are daily occurrences – and yet she loves to wrestle with her daddy, play outside in the dirt, and climb, jump and run. She loves to say prayers with us, sing songs, do any kind of art project, and is smart as a whip. She starts Kindergarten in the fall and I’m completely in denial. Completely. So, I could’ve picked a better picture. But this SO embodies his Eeyore-like personality. We adopted him from the Humane Society two years ago and we think he is about 3 or 4? We’re not sure of his breed, just that he’s a Lab mixed with Hound, maybe? Anyway, he truly is the very best dog. He’s beyond gentle with Hadley or any child, loves to be near us to a fault – this pic above was taken after he followed me all.over.the.house for a whole afternoon and I finally told him to go lay in his bed. He decided to lay moping at the bottom of the stairs – and hates to be outside. It will be a perfect 75 degree day and if he’s outside alone, he’s whining at the door to come in. I just realized I probably should’ve put the baby over the dog. Sorry, baby girl. You will always rank above the dog in my heart (#notacrazydogmom)! Anyway, this little sweet thing is expected to arrive in early June and we are so incredibly excited for her. She was so long awaited and an answer to many prayers sent to heaven, which I’ll definitely share about soon. My pregnancy has been a breeze so far, knock on wood, and I can’t wait to meet this little mover and shaker in my belly. Considering her movement patterns, I’m thinking we’ll be well acquainted at all hours of the night and early mornings. There you have it! We’re a little family living a small town American life, and I wouldn’t have it any other way….most of the time. Some of the time I miss shopping and restaurants and life outside of the rural Midwest. But truly, I love our life and what we’re growing, and it’s pretty humbling to look around and see all of our blessings. This entry was posted in Uncategorized on February 4, 2017 by seannahansen. How many blogs is it possible for one person to have? I don’t know…but I think I’m at number 4! I know I could go back to any of those and pick up where I left off, but each one seemed to be for a certain season in my life – living abroad, engaged and newly married, new mama. I’m not sure what new season this one is for, maybe new mama x 2? At any rate, I wanted a place to share everything from family happenings, my own personal life happenings, thoughts, fun stuff, etc. And now that we’re diving into a new year I figured it was the perfect time to do so! This entry was posted in Uncategorized on September 7, 2016 by seannahansen. I'm Seanna, wife to Brad and a stay at home mama to Hadley (4yrs) with one on the way in June! I'm crazy about stripes, black+white everything, wine and chocolate.